Nicholas Wolfram fell promptly in love with tabletop and video games when he was only two years old, and he has been writing about them since he figured out how words worked. Now he puts together words about Magic, which he started playing way back in 2000. As part of our preview season for Ixalan, we are going to take a deeper look at some of the cards previewed on our own homepage. Today, we'll be peering behind the scenes of the process that went into creating the design and art of Conqueror's Galleon (and its flipside, Conqueror's Foothold), which was previewed in Ken Nagle's Card Preview article today. 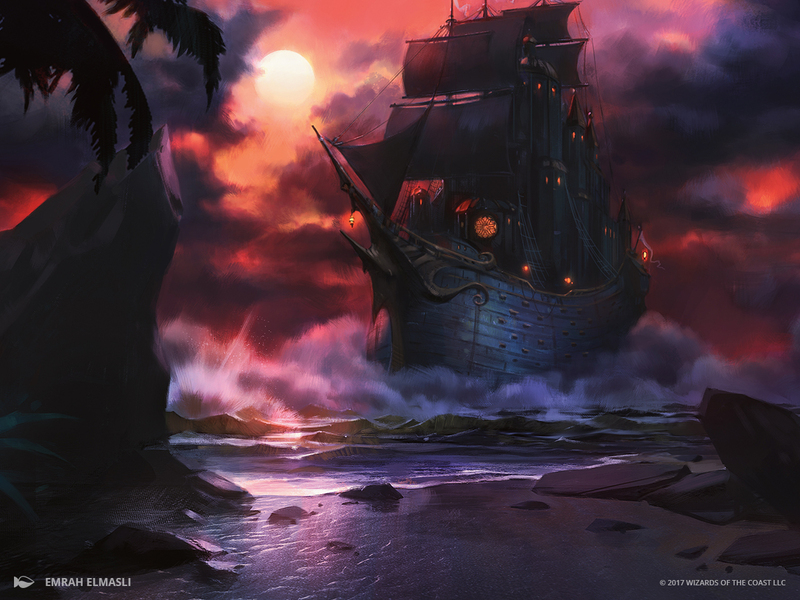 Conqueror's Galleon was among the first double-faced card designs that R&D pursued for Ixalan. After deciding to implement double-faced cards that transform from nonlands into lands, the set team settled on this top-down design to capture a specific flavorful scenario. One of the Vampires' ships successfully discovers an uncolonized land mass. The Vampires deconstruct the ship to use its materials to establish a new colony. As time goes on, the colony becomes more developed and more powerful thanks to increased resources. 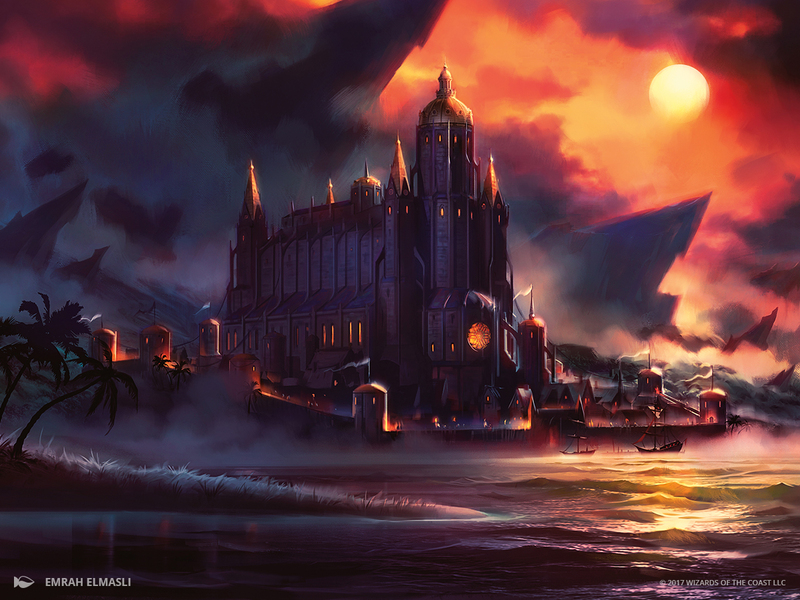 Action: A huge Legion of Dusk ship drifts across calm waters. Mist clings to the surface of the water, and dark clouds churn in the sky. The ship trails black smoke, and the clouds are darker and stormier behind the ship. Rather than smaller ships around it, we see the coastline as the ship approaches it. Mood: Here comes the storm—both the weather and the invading Vampires. Action: The great ship shown on Conqueror's Galleon has landed, and the Vampires aboard have transformed the ship into a colony. The huge cathedral-like structures from the ship's deck now stand on the ground, magically transplanted from the ship to shore. A wooden palisade made from the same dark wood that once formed the hull surrounds the colony. Other elements of the ship's construction and decoration might also be visible in the colony. The mist and dark smoke seen on the front now cling to the land around the colony. The sky above is stormy. Ideally, we can make out the gleam of golden armor worn by soldiers keeping watch on the palisades. Vampire banners fly over the fort. Mood: Now they're here to stay. The light sources we saw on the ship now come into play as the windows of the building, with the large, circular window being the clearest connection. This combined with the shape of the tower structures and spires make it clear what transpires when the Vehicle is transformed into this land.